A friend from Malaysia is running the Comrades Marathon for the 2nd time. Like his last attempt last year, Frank is using the run to raise funds for Cancer Research Initiatives Foundation (Carif) and create awareness of cancer. More information about the Be Frank campaign can be found here. Frank himself is a cancer survivor who was diagnosed of Rhabdomyosarcoma, a rare form of cancer that affects muscle and connective tissues at the tender age of 12. Today, he has accomplished what was seemingly impossible, he has trained as long distance runner and is now an ultra-marathon runner. To help in this meaningful initiatives, make a direct donation at Carif or buy a t-shirt at RM60.00 each. The 2nd Skin t-shirt (super comfy microfiber material) can be bought from - CARIF Main Laboratory, 2nd Floor Outpatient Centre, Sime Darby Medical Centre, Subang Jaya. Tel: +603-56391874 or Running Lab, Tropicana City Mall. Malaysia Tel: +603-7727 8555. 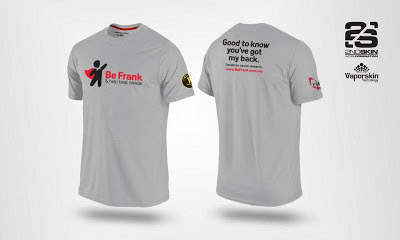 Singapore runners who want to buy the t-shirt can contact Frank directly via the Be Frank's facebook page and I am sure he will be able to work out some arrangement for some Singapore runners going up to bring the t-shirts to Singapore.